I have been interested in Korean culture ever since my cousin recommended me the film “My Sassy Girl”. Since then I have dedicated my free time to learn more about Korea from their films, music and now their language. 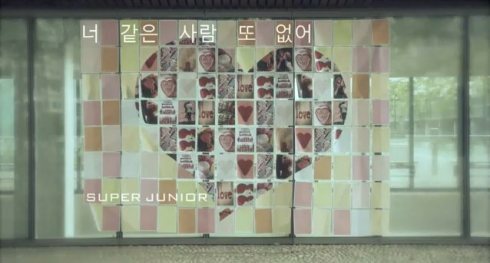 Korean wave (Hallyu; 한류) became very wide spread not just in Asia but even in some parts of Europe, Australia and America. Then there came PSY a South Korean singer/rapper who became know internationally with his viral song “Gangnam Style“. His music video has already reached 1.6 billion hits on Youtube. No doubt PSY has made a great contribution to spread Korean wave to a much broader audience. PSY is the new icon for Korean tourism. The Korea Tourism Organization has launched the “PSY’s Wiki Korea” campaign where PSY explained the twenty-seven (27) topics related to Korea. The topics were categorized into three (3) categories namely: Food, Fun and Shopping. 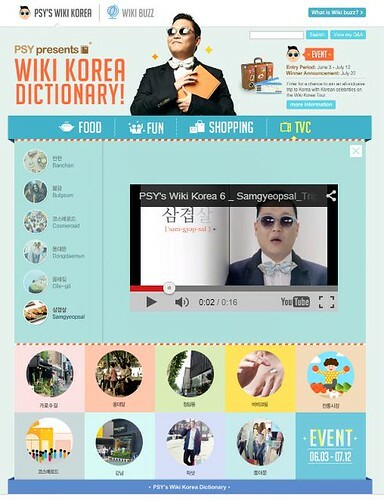 The 27 popular topics explained by PSY symbolizes what the Korean culture can offer. Six (6) commercials were shot by PSY for “PSY’s Wiki Korea”. On the commercials he explains the words in Wikipedia style, from how to pronounce it and its meaning. All these TV commercials are shown in many countries worldwide thus promoting the Korean culture to other nations. Samgyeopsal [Sam-gyeop-sal; 삼겹살] is Korean’s pork belly barbecue. Koreans usually eat samgyeopsal with accompaniments such as green onion salad, lettuce (Sangchu; 상추) and paste (Ssamjang; 쌈장). Since pork is cheaper than beef in Korea, samgyeopsal is a dish where anyone can eat without having to worry about the price. I have known about samgyeopsal through the Korean series I have watched. In every scene on the dining table or restaurant samgyeopsal is always present. Pork belly barbeque sounds common but samgyeopsal is way different why? It’s because on the way it is prepared. Here in the Philippines the cooking area and the dining table is separate. First we prepared the dishes we will eat. Then after cooking we have to set the dining area and there we will eat the dishes we have cooked. But in Korea or in case of preparing samgyeopsal, their table has grills on it. They eat it straight from the grill. The pork belly was cut into bite size. It is then grilled on the grilling pan which is set up on the dining table. It is a customary where those who will eat it will be the one to grill it. While waiting for the pork to be cooked the diners can catch up with each other’s lives. This adds up to the beauty of eating a samgyeopsal. Samgyeopsal is commonly eaten with lettuce and paste. First get a lettuce leaf and put a pork belly in it. Then add green onion salad, and paste depending on your liking. Fold the lettuce leaf and eat it whole. Don’t bite it because it will break, you don’t want to leave ssamjang stains on your shirts. Ssamgyeopsal is best paired with soju (소주). What do you think of when you hear the word “Korea”? This entry was posted in Korean, My Thoughts and tagged 삼겹살, Korea, Korea Tourism Organization Manila, Korean Dish, KTOManila, My Korean Icon Contest, Psy's wiki korea, samgyeopsal. Bookmark the permalink.